Mini-Flyers and Lawn Signs – Promote Your Sale! Mini-Flyers and Lawn Signs can be ordered online by CLICKING HERE. 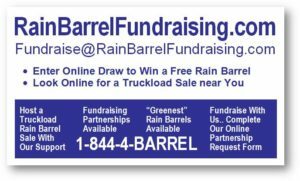 This generic flyer is a quick and easy way to provide essential information that people can use to order their rain barrel. Right from our home page, people can easily find your sale as they are listed by location. So people in your area will look and find your sale. They are also easy to carry and hand out and are an effective resource to help achieve a successful sale. They can also be attached to your organization’s own material and save the need for printing new handouts for your sale. Below is a sample image of our lawn signs which are available for loan for your sale. Lawn signs are a great way to draw attention and promote your sale throughout your community. We offer to ship up to 5 lawn signs to every partner.